William Whiston succeeded Sir Isaac Newton as Lucasian Professor of Mathematics at Cambridge in 1703. Like his predecessor, Whiston presents an interesting combination of the scientific and the theological mind, but whereas Newton carefully concealed the true nature of his religious beliefs, Whiston, a well-known preacher, did not. This is the first modern full-length study of Whiston's Newtonian rapprochement between science and religion. Professor Force examines the writings in which Whiston applies his Newtonian Biblical interpretation to social, political, and theological issues in the context of the Newtonian movement at the turn of the eighteenth century. 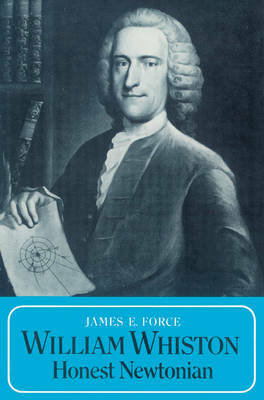 The book revises the conventional view of Whiston as a figure peripheral to the Newtonian movement and reveals the nature of Whiston's 'Newtonianism' and his individual eccentricities. It also offers valuable insights into Newton himself and the religious beliefs he so often concealed.